This “City of Fun and Adventure” that plays host to the exciting beauty of famed Mt. Mayon is adding another product to its booming tourism industry—nautical tourism. About two years ago, the city government under then mayor Geraldine Rosal launched its Marine Environment Development Program (MEDP) with then city councilor Carlos Ante as program chairman. At the same time, the city’s Fishery Law Enforcement Unit (FLEU) was strengthened towards stepping up its sea patrolling operations to deter illegal fishing and other activities detrimental to the coastal and marine resources within the limits of the local waters—a hug portion of it covered by the huge body of Albay Gulf. MEDP is focused on the maintenance of the city coastal waters’ biological integrity, productive capacity, health and vitality of ecosystem, contribution to global carbon cycle and long-time socio-economic benefits through effective legal and institutional frameworks. “We started with the restoration of the coral reefs and seagrasses that suffered heavy damages due to destructive fishing and other seaborne activities in the past. We also restored the mangroves, and today, these works are already showing significant gains leading us to say that our territorial waters have already regained their lost vitality,” Ante told the PNA here on Saturday. Today, the city’s waterscape, with beautiful white surging surfs of the ocean gracefully sweeping to form a sharp contrast with jet-black volcanic sands underneath up to the natural formations of the long stretch of beach, has become a natural wonder itself added to the majestic view of Mayon Volcano. And since this exciting water that is part of Albay Gulf, described as the calmest among dive sites in the country, has been luring throngs of travelling divers from all over the world, the city government now offers a place that makes every diver’s escapade into the local underwater environment truly memorable. “We now have underwater parks that make the six dive sites identified to be within the city limits more pleasing for both scuba divers with experience and for novices who want to explore our marine life beneath the level of our waters,” Ante, himself a master scuba diver, said. He said the MEDP started establishing the underwater parks two years ago by way of coral gardening, a cost-effective system of growing and transplanting corals to restore degraded reefs. 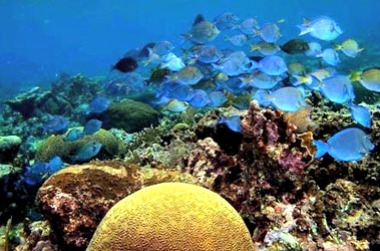 It is an innovative propagation of second-generation corals and combines strategies for sustainable management of marine ecosystems with restoration of coral reefs and associated habitats, Ante explained. In this approach, nurseries are established by trimming coral fragments from existing wild populations then securing them on underwater structures. The original coral is grown over a number of years and trimmed or propagated every 9–12 months, increasing the original fragments by 10 times. The city government spearheaded this noble endeavor helped by an organized group of local dive experts and marine environmentalists who have put up the Pacific Blue Dive Center (PBDC), which conducts coral reef researches and evaluations within areas of Albay Gulf covered by the city. The group is also behind the application of the biorock technology for the natural coral rehabilitation using genetically modified bacteria to speed up coral growth in support of the coastal resource management programs of the city government. Under this initiative, divers construct crisscrossed metal panels installed with concrete disks that serve as substrates where second-generation corals are planted and grown to become new colonies that take part in reef building. These restored coral colonies now serve its reef-building role, making the city’s dive sites very much presentable now as a divers’ park of healthy growing corals arranged in gardens forming the marvelous underwater environment and teeming with exciting rare fish species like clownfish or anemone fish and trumpetfish (Aulostomus maculatus), Ante said. To make the park identifiable as that of here, Ante said, markers bearing the city’s name printed in highly luminous colors were erected as a backdrop so that divers who want their pictures taken underwater can have these markers as landmark. Among the dive sites covered by the park are the Itom na Buya (Black Buoy) and Sadit na Itom na Buya (Small Black Buoy), both off the coastline of Barangay Bigaa here and a 25-minute boat ride from the base port. The PBDC classified these dive sites to be of three types -- shoreline with short shallow area and sandy bottom; a peninsula with waters directing off shore after a long shallow area; and as independent underwater banks. The areas surrounding the underwater park has also been made ideal for leisure fishing like angling, a method applying the classic “hook, line and sinker” gear arrangement. To do this, Ante said, artificial reefs have been set in place to serve as fish colonies where anglers could drop their fishing gears for exciting catches. “So now, we are ready with our next product as a leading travel destination -- nautical tourism -- that would reinforce our ‘City of Fun and Adventure’ title in the travel industry world,” Rosal declared. Nautical tourism, the city mayor explained, can include such activities as recreational boating, marinas, cruises, water sports, marine wildlife tourism involving (marine parks), maritime history and education and associated land-based components such as hotels, resorts, cafes and restaurants. This form of sustainable tourism can create many new opportunities as well as bring about a refocusing of existing mature tourism operations.